But every year, I am let down. (Well, except for one year at work when a client sent the whole office one tin to share. That puppy was gone in a day, though, and I had to share it with 14 people.) I’ve decided to take matters into my own hands. 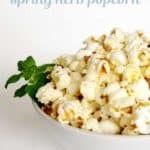 I’ve already explored a lot of recipes for popping corn on the stove — remember this chipotle lime version and this one with spring herbs? 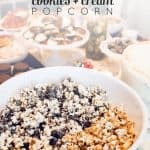 I love making popcorn at home and then jazzing it up with unexpected flavors. 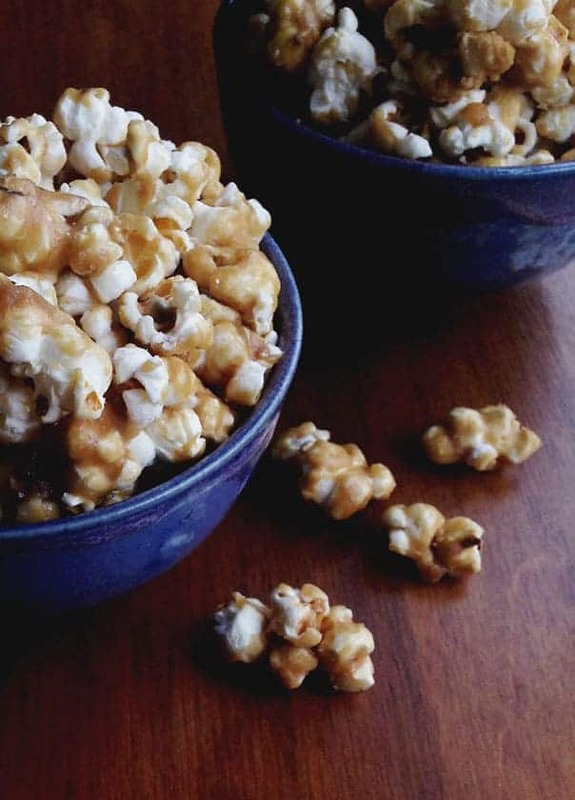 Click below to see the recipe for Salted Caramel Popcorn! 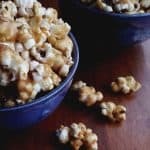 This Sea Salt Caramel Popcorn has the toffee crunch of regular caramel corn, plus a sprinkling of salt to balance out the sweetness. Make the popcorn. In a medium saucepan, bring oil to a simmer over medium-low heat, stirring often. Add popcorn kernels in a single layer and cover saucepan with a lid. When the popcorn begins to pop (after about 2-3 minutes), shake the pot over the heat for about 3 minutes, until popping slows. Remove from heat immediately and let cool. Prepare baking sheets. Preheat the oven to 200F degrees. Spread the popcorn out onto 2 large baking sheets. Set aside. Make the caramel. In another medium saucepan, melt butter on medium-high heat. Add sugar, corn syrup, cream of tartar and salt. Stirring constantly, bring mixture to a boil for about 5 minutes. Working quickly, remove saucepan from heat and stir in the baking soda. Mixture will become thick and bubbly. 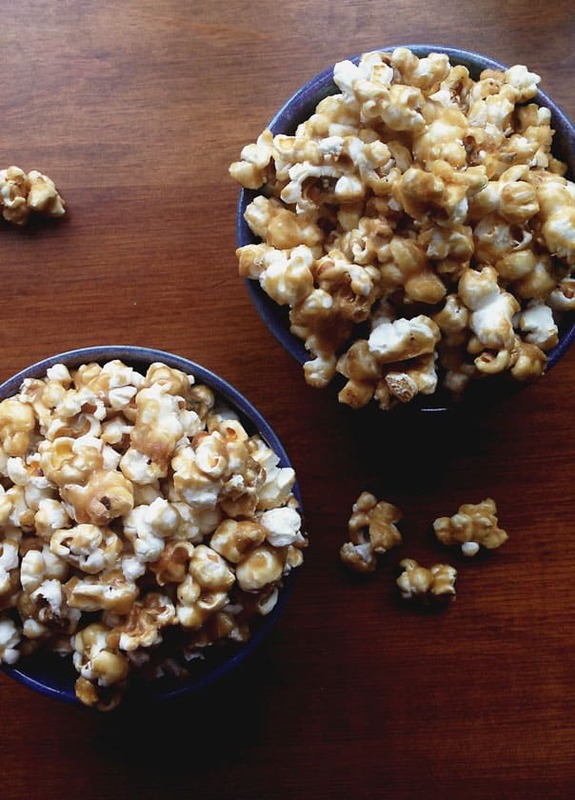 Pour the caramel mixture over the popcorn and toss gently until all the kernels are coated. Place baking sheets in the oven and bake for 30 minutes. Remove pans one at a time and stir each one again before heating for another 30 minutes. Season and cool. Remove from oven and sprinkle with sea salt. Let the popcorn cool on the pan. If desired, break apart any large clusters. Store in an airtight container for up to 2 weeks. How do you do this? Just yesterday, I was thinking what a great handmade gift it would be to make salted caramel, and package it with some popcorn in a big, pretty popcorn bowl. Maybe add a DVD. And here this is! Seriously, where is your hidden webcam in my office? Now I’m going to get to add a pretty print-out of your recipe to my gift! 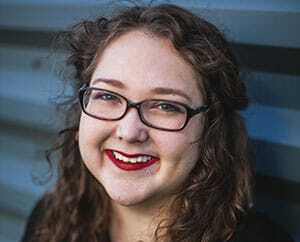 Oh Melissa! This makes me smile. I am so glad that we are on the same wavelength. I am definitely not spying on you but I hope that one day soon we will figure out our video chat! I’m so sorry I am behind on comments & emails. I’ll be in touch soon! I think your gift idea sounds amazing. Recipients will be very lucky! Oh my gosh, I neeeed this in my life! I hope this makes an appearance at the blogger bash 😉 Just sayin’! I’m hoping that happens! It really is just so good! This popcorn looks amazing! So much better than the kind in the tin, although I do enjoy snacking on that 🙂 I love the sweet and salty combo of this! You are a genious! 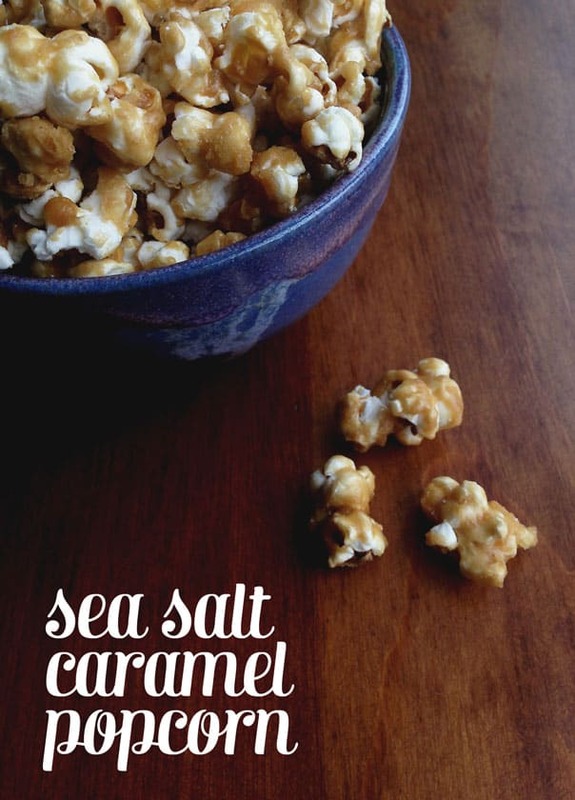 Caramel is my favorite popcorn topping, and I am obsessed with sea salt. This is such a great combination! Thanks so much for your comment, Jenna! I too love anything and everything sea salt caramel. Always divine. Oh man, you cannot go wrong with caramel and sea salt! 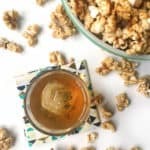 Popcorn is my favorite food in the whole world but I’ve always been afraid to make caramel corn on my own–I’m totally going to give it a try! You definitely need to try it yourself, Amy! It seems scary with the stovetop part, but it’s actually so easy! I was surprised myself. Yum! This is right up my alley! 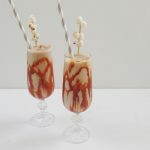 Salty sweet is the perfect combo! It totally is, Lee! I love anything sweet and salty. Thank you so much for your comment. So glad to meet you too, Angela! I really appreciate your comment. It’s always nice to connect with other bloggers. I bet Southport and Oak Island is a beautiful spot to live in. I’ve never been, but I must go! Glad you like the caramel corn — it really is addictive and amazing all at once. Must make more ASAP!